Dengue virus (DENV) is a single positive strand RNA virus of the Flaviviridae family and a causative agent of the infectious tropical disease Dengue Fever. There are four serotypes of the virus, DENV-1, DENV-2, DENV-3 and DENV-4. Dengue NS1 (Non-Structural protein 1) is a versatile glycoprotein of the dengue virus that is secreted as a hexamer, binds to the cell surface, and has immune evasive functions. Dengue virus NS1 antigen is also used as an early detection marker (days 1 to 9 after onset) for dengue virus infection. B7050 was generated by immunizing mice with recombinant DENV-2 NS1 expressed by human cells and purified from ascites via protein A affinity chromatography. It recognizes all 4 types of DENV NS1 in an order as: DN2=DN3> DN4> DN1. 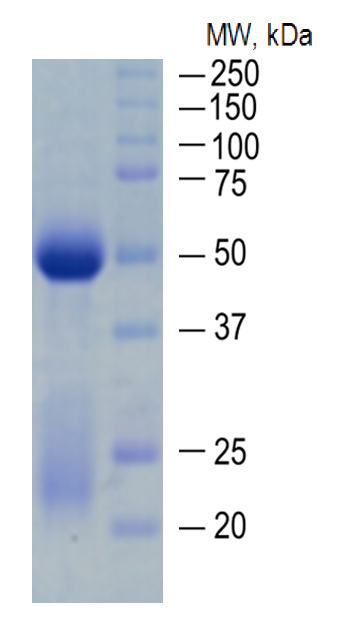 Application Coating or conjugate antibody in ELISA, ICT. Pairing with B7060.